I am mad at you! I’ve been thinking about this over the last few days. And it’s made me think about my relationship with God. (There’s nothing like a good old fashion hate note to get you thinking, right?) When we accept Jesus as Lord, we are told that we can call Him Abba! Daddy! (Romans 8:15) He says we can speak to Him. We can crawl up in His “spiritual” lap and enjoy simply being with our Daddy. We can tell Him anything… even that we’re mad at Him. 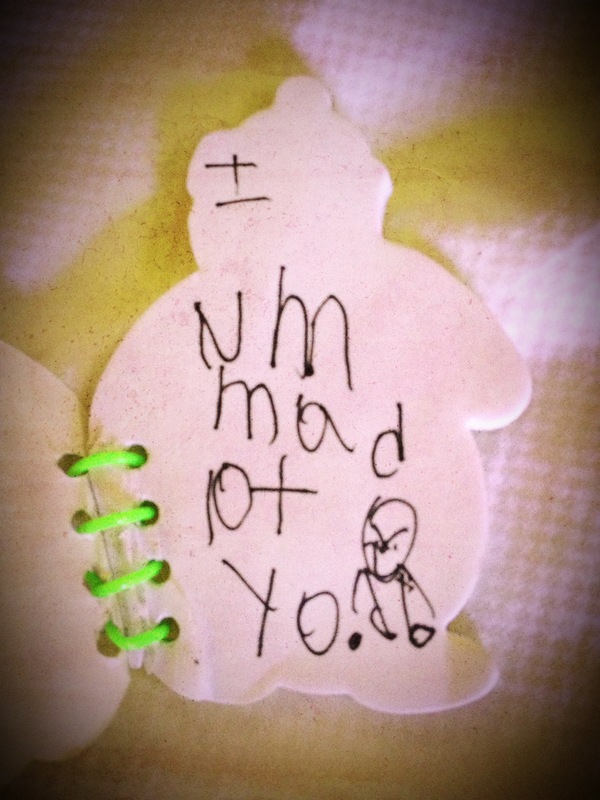 We can storm off to our room and then slip Him a note on a penguin pad that says, “I um mad at yo! (Insert mad face with VERY furious eyebrows!) We can fold our arms and give Him the best pouty face we can dare muster up. Communicating our frustration with Him is better than the alternative… not talking to Him at all. Not trusting Him with our feelings, with our frustrations, or with our disappointments. Growing distant or giving God the silent treatment does not grow our relationship—it hinders it. I have to admit, that’s a habit/cycle in my life that I’ve had to work really hard to break. There have been times I’ve thought I could teach my spouse a lesson by giving him the cold shoulder. I’ve grown cold to friends in hopes that they would get the message that “I am not happy with you!” I’ve even thought I could teach God a lesson, by pulling away. But lack of communication with God hurts us. Distance cannot mend. It cannot bring about healing or understanding. It is not a relationship builder—it is a relationship breaker. It thwarts growth and steals the opportunity to love despite differing opinions. And lets be honest, we have a skewed and limited perception of real love and what that looks like. Can’t we just take Him at His word that Father knows best? I’m thankful Noah felt comfortable enough to say to me, “I am mad at you!” I want to know how he’s feeling. Maybe truth will reign as we communicate. And maybe he’ll hear my heart as I seek to show him there is love even in discipline. There’s love even in the “No’s.” That simple expression of frustration might usher in deeper intimacy and trust despite feelings. Honesty is vital! You can’t understand His love for you if you are not willing to be real before your Daddy. Maybe there’s someone out there that needs to stop being religious and start being real. Sometimes we play the “I’m fine” card when we are anything BUT fine! Have you had this conversation? “I’m fine,” I say, purposefully not making eye contact and scrubbing the counter. My husband won’t let me play the “I’m fine” card. Here’s one of my favorite moments when I tried to play my card and Dallas called me out! We’d had the above conversation and at that point he had been following me around as I cleaned in huff. After tailing me from room to room with no interaction he said, “I feel like Patrick Swayze in that scene in Ghost when he’s following around Demi before he realizes he’s a ghost.” At that point I turned and made eye contact with him and began laughing so hard I seriously forgot what I had been fuming about. And after I remembered… I was mad again… just kidding! We had honest communication and the relationship was strengthened. Tell Him how you are feeling even if you know that you are not justified in your feelings! Honest confession is not only beneficial in this relationship, but it’s necessary. And the good news is… if He has anything to do with it, you won’t stay mad long. His kindness leads to repentance and repentance leads to our growth and growth leads us to wholeness and in our wholeness we mirror our Daddy. And there’s nothing like looking more like Him. So what do you need to say to Him today? Beautifully said. I had that exact conversation with God last night. My son once wrote on his blackboard: I dont lik you. Same scenario. Oh Heather, this made me laugh. And you are so right. I have been there–not talking to God. It’s no good. This is a great reminder to consider it in the parent/child context. I would much rather my kids tell me stuff, even if it’s not good, than not talk to me at all.